Volkswagen will finally integrate Apple CarPlay in its 2015 lineup of vehicles starting later this year. Selected vehicles will also get the Android Auto option. With App and smartphone integration, VW will take its dashboards to the next level of infotainment. They will introduce the second generation "modular infotainment platform" (MIB II) in the United States later this year. Along with the new infotainment system, MirrorLink will also be available for the first time, integrating apps and operating layout of numerous smartphones (including Samsung, HTC, LG and Sony). 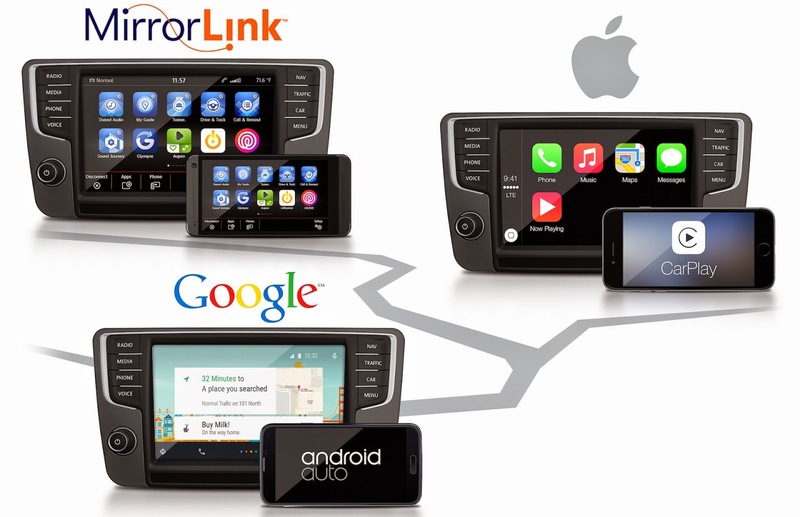 When MirrorLink is introduced, two other interfaces will be launched under the App-Connect label: Apple CarPlay and Android Auto. VW will also launch CarPlay and Android Auto in the European market. At CES 2015, VW is showcasing the Golf R Touch concept vehicle. The car features an infotainment system that incorporates gesture control as the next step in the area of intuitive control. There's also a Connected Golf at the event which will be equipped with the upcoming MIB II infotainment system. Other features being shown off are the e-Golf Intelligent Charge and e-Golf Perfect Parking. Full details are available in the VW press release.